Hanging the ledger for a pergola structure on the exterior of a house is typically done by bolting it onto the exterior wall. However, if a gutter is located at the same level as the ledger for the pergola, you will need to use a different method. To hang a pergola ledger around a gutter you need to attach it to a bracket that is mounted on the wall behind the gutter. Count the number of lag screws that are used to secure the gutter to the exterior wall. Measure six inches of the 1/2-inch PVC pipe with the tape measure. Make a cut mark with the felt tip marker. Cut the PVC pipe with the hacksaw. Repeat this step for the number of lag screws that you counted in step 1. Remove one of the lag screws with the power drill. Place a Simpson ABU66 post base in-between the back of the gutter and the fascia board. Insert the lag screw into the hole in the post base and the front of the gutter. 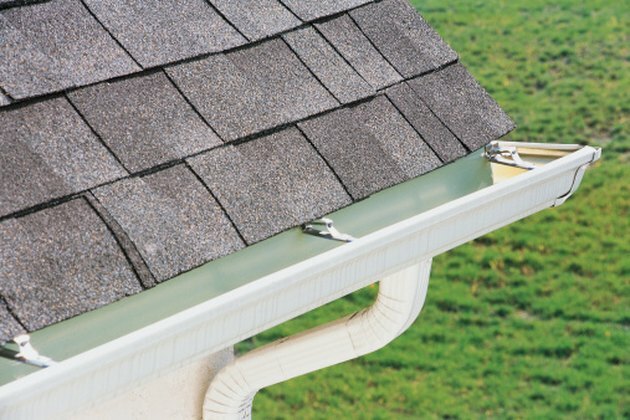 Place a 6-inch length of the PVC pipe over the hole on the backside of the gutter. Slide lag screw into the PVC pipe. Secure the lag screw to the exterior wall with the power drill. Repeat steps 3 and 4 to install a Simpson ABU66 post base where each lag screw is located. Set the ledger for the pergola in place on the side of the post base. Mark the bolt hole locations on the ledger with a pencil. Drill a hole for the bolt with the power drill. Place the ledger back on the post base. Insert a galvanized bolt into the bolt hole. Insert a washer and a nut over the end of the bolt. Tighten the nut with the wrench. Repeat this at each post base to secure the ledger. Cameron Easey has over 15 years customer service experience, with eight of those years in the insurance industry. He has earned various designations from organizations like the Insurance Institute of America and LOMA. Easey earned his Bachelor of Arts degree in political science and history from Western Michigan University.